Fantasy Premier League Gameweek 26 sees the return to normality with a single fixture for all 20 clubs. 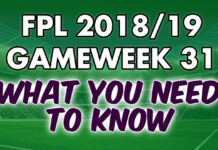 The Double Gameweek proved to be very rewarding, or not in some cases, for FPL managers. In this Gameweek 26 preview we look analyse the odds of each fixture and look at the top captain contenders. With the occurrence of the first Double Gameweek of the season, it was unsurprising to see Gameweek 25 produce a high yielding gameweek. The average points scored was 65. Heung Min Son was the mos transferred in player after returns of 9 and 11 in the last two. Mohamed Salah was the most captained despite not being a player with a Double Gameweek. Moreover, Liverpool were away from home against West Ham. However, this can simply be explained by his high percentage whereas Man City captain choices would have been more fragmented. 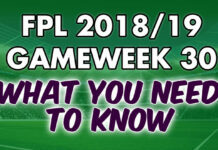 Aymeric Laporte ended up being the highest scoring player of the gameweek after scoring 20 points across Man City’s fixtures with Arsenal and Everton. Sergio Aguero was a single point behind with 19. Fantasy Premier League Gameweek 25 overview! 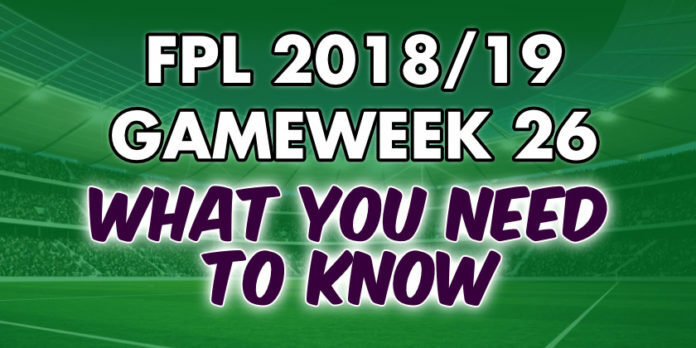 Here is our Fantasy Premier League Gameweek 26 cheat sheet. No returns for Mohamed Salah in the last two gameweeks hasn’t stopped him being, statistically, the best captain for this week. The bookmakers have him at 60% to score. On paper Liverpool’s home fixture against Bournemouth also adds to Salah’s appeal. It is worth noting that Bournemouth have kept clean sheets in two of their last three matches though. So, what to do if you’re not a Salah owner. Sergio Aguero is another option. His goal scoring record at home is well documented. Even against Chelsea, he will be tempting many FPL managers to put the captain’s armband him. If he was guaranteed to start then maybe this decision would be easier. However, he has started twice for Man City in the last week. Therefore, he is at risk of rotation although he probably will maintain his starting place. A more certain option of starting is Heung Min Son. The South Korean has been on fire since his return from the Asian games. He has scored 20 points in those two matches. Going by form, he is the man to captain. Leicester have, however, performed well in games against the big 6 this season. Other alternatives include Pierre Aubameyang. He would have likely been second choice to Salah but recent news is suggesting his illness is more likely to keep him on the bench than first let on. Salah’s teammate Sadio Mane is another choice. He has been performing with a goal in each of his last three Premier League matches. A final option is the enigma Paul Pogba. Since Ole Gunnar Solskjaer’s arrival, Pogba has scored or assisted at least once in every game bar one.